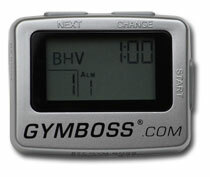 The Gymboss offers a whole new take on the concept of 'interval timer". This nifty little gadget helps you to make the most of your workout with little extra effort in the planning area. With the Gymboss you can learn to run or improve your Tabata and HIIT training programs to the maximum level. Sounds like a miniature miracle worker, doesn't it. This little interval timer can almost replace your personal trainer! If you need more information on how this amazing product works and how to set it up, simply browse the website and you'll find everything you need to know. The Gymboss is small, efficient and easy to use  you won't be disappointed. GYMBOSS WILL MAKE ANY WORKOUT EASIER TO PLAN AND EXECUTE WITH MORE ACCURACY AND CONSISTENCY. 1 or 2 intervals - 2 seconds to 99 minutes Repeat up to 99 times Beep and/or Vibrate alarm Alarm duration 1, 5, or 10 seconds Stopwatch function Secure Belt clip Compact Size (1 ¾ x 2 ¼ x ½ inches) Water and shock resistant AAA battery required The Gymboss interval timer will give your workout the discipline and structure necessary to take your workout to the next level. This easy to use timer will allow you to control intensity and allow you to focus on the workout to get the best results possible! Get the GymBoss in Kingston Here!